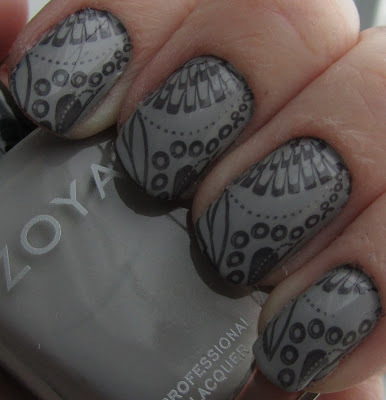 For the pattern, I used Zoya Kelly, Dove's older cousin from the Fall collection, and Konad plate m78. I really loved the gray-on-gray combination. I find myself really loving these more neutral colors a lot, which is funny because back before I became obsessed with polish I probably never would have thought to wear them. Now they seem to be some of my absolute favorites! you are so good at konading! i could never line the stamp up that well! I'm so jealous that you have the new collex already-looks great! Totally awesome combination, love it! Love it! Subtle, and I like the grayscale idea. this combination is practically perfect. love it!